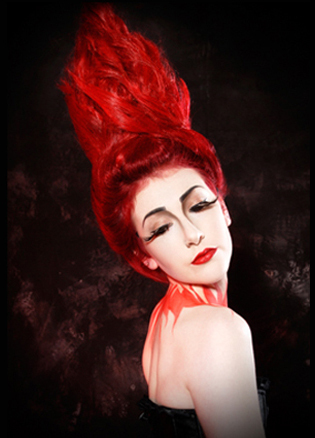 The Flame shoot was part of the Fantasy Fashion series, so called as the model’s bright red hair was styled to resemble a flame. Each shoot comes with its own challenges and the Flame shoot was no exception as no matter how well the organisation and detailed forward planning sometimes problem solving is inevitable on the day, especially when dealing with something as unpredictable as smoke. 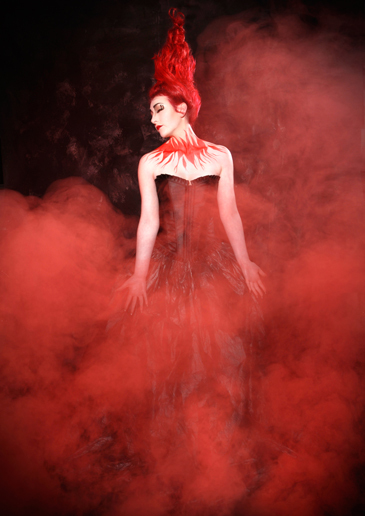 The original concept was to depict the model with flame styled bright red hair with make-up echoing the flame theme, emerging from billowing red smoke. 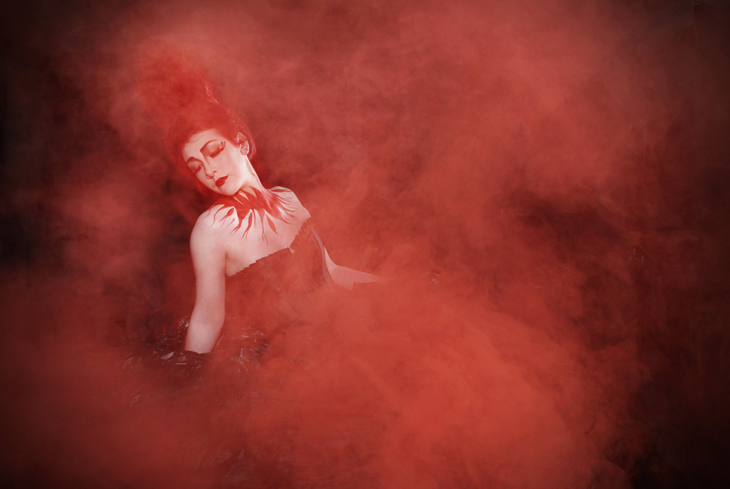 We had planned to use red smoke pellets as smoke machines do not have a facility for coloured smoke and although red gels were used to enhance the textured backdrop we wanted clear light to illuminate the model. A device with small wheels that could travel had been constructed to enable us direct the smoke, however unfortunately this device was not as versatile as first hoped so an alternative was needed. After various suggestions and some deliberation we placed a piece of slate onto a skate board (believe it or not) where we placed the smoke pellets, a long pole was taped to the underside of the skate board to use as a handle. Unbelievably this was a great success ....it allowed us to slowly pass the billowing smoke in front of the model to create the desired effect, without obstructing the camera.....sometimes the most simple ideas work best! 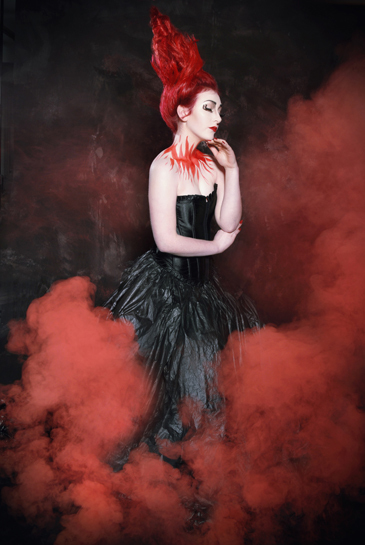 Rose Goodwin our model was great and did not complain once about being constantly covered in smoke even when she could hardly see the camera in front of her! The hair brief was interpreted brilliantly by Hairstylist Tony Arts while the amazing hair colour was created by Wilds Hairdressing. Lovely Josephine Birkett produced amazing makeup ( Josephine Birkett MUA )..... plus David Waters was a star with our make shift smoke contraption which he manoeuvred with skill and has been affectionately known since as the ‘Smoke Man’!